The Solid State Logic Fusion is an all-analogue 2U stereo outboard processor created for the modern hybrid studio. The Solid State Logic Fusion introduces five completely new analogue colouration tools designed to bring the perfect combination of added tonal character, weight and space to your mix bus or stereo stems, with the detail, warmth and finesse that only real analogue circuits can provide. 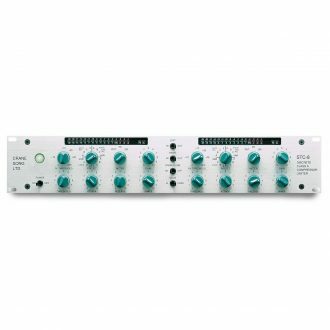 The SSL sonic legacy is built upon a much-emulated collection of analogue audio processing tools that have featured in generations of studio consoles; pristine mic pre’s, classic Channel EQ & Dynamics, the legendary Stereo Bus Compressor, the Listen Mic Compressor, and the unique SSL summing bus. Fusion takes SSL into a new era with the introduction of a suite of new analogue processing tools that offer exceptional tonal character and versatility. 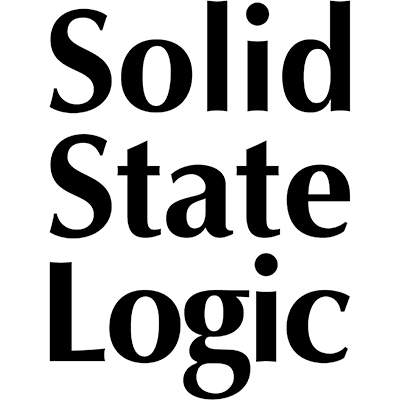 The Solid State Logic Fusion expands the processing palette for hybrid studio owners and is a superb partner for the SSL Stereo Bus Compressor. 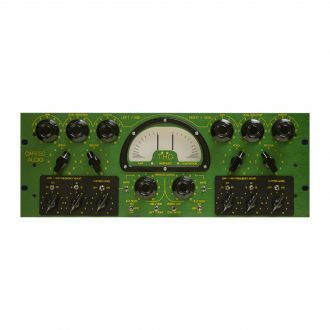 Vintage Drive – is a unique non-linear harmonic enhancement circuit that brings cohesion and strength to your mix. Drive and Density controls interact to produce harmonic saturation and soft compression derived from overloading an analogue circuit. It can be used lightly for subtle thickening saturation or driven hard for more extreme distortion. The SSL Violet EQ – an all-new minimum phase-shift, two-band shelving EQ. 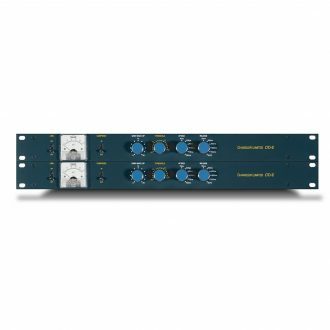 The first new SSL analogue EQ circuit for more than 25 years draws on the SSL legacy of carefully selected frequencies and response curves to create a musical and intuitive EQ designed to quickly dial in low-end weight and high-end sheen. 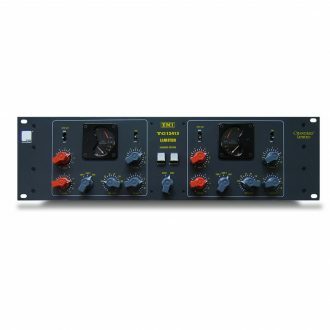 High and Low frequency circuits each offer four switched frequency points and +/-9dB attenuation. SSL has also always been known for clever connectivity and features that streamline and accelerate production workflow. 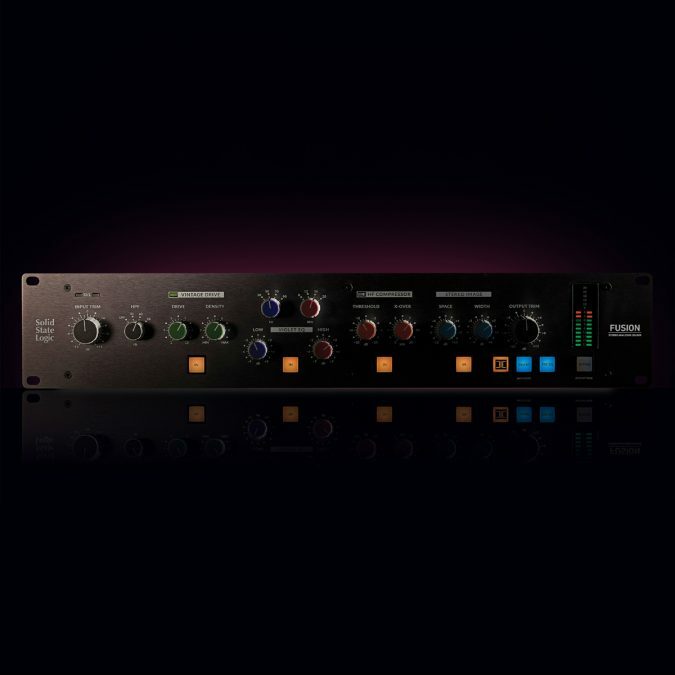 The Solid State Logic Fusion fits right in with a collection of workflow enhancing features including: +/-12dB Input and Output Trim controls, an Input overload LED, large peak-hold metering, a front-end 3rd order High Pass Filter with three selectable cut off frequencies, and tri-colour status indicators for the Vintage Drive and HF Comp sections. 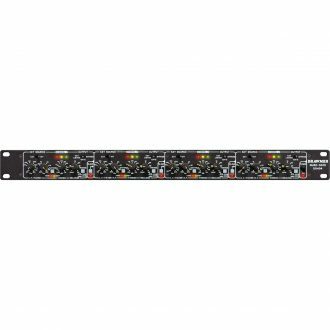 A set of XLR connections can be used either as a Stereo Insert for stereo mix bus processing or switched to function as a Mid-Side (MS) circuit enabling separate compressors or EQ to be applied to the middle (centre) and sides of a stereo signal. In Stereo Insert mode the insert point can be switched to pre-Violet EQ, when in MS mode the insert can be switched to pre-Stereo Image controls. Input and Output connections are via XLR.